Products that are easy to use. Seriously. We have exclusive relationships with some of the best display manufacturers in the world. This gives you literally hundreds of display options to choose from. Find your solution! Whatever your exhibit or display needs, Ladedo can help. Whether you want objective, product neutral advice on how to achieve your display goals or a specific type of solution to stand out on the tradeshow floor, we can help. We're committed to giving you a total solution to your display needs. We have exclusive relationships with some of the best display manufacturers in the world. This gives you literally hundreds of display options to choose from. Portable display systems - smart, lightweight. Just fold them up when you're done. 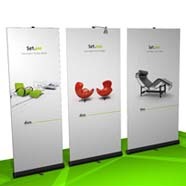 A wide selection of banner stands - innovative designs that take fabric or photographic images, and are so easy to set up. Components based custom exhibits - state-of-the art materials enable you to add, subtract, and re-configure for different shows or needs. An entirely new, bold look for lightweight custom exhibits. Very affordable, yet destined to set the standard for years to come. Or maybe you want to make a bigger splash with a unique, custom exhibit solution. We can design and build something that is tailor made. 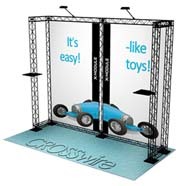 Rent or lease: a great option for some display needs - ask us about the pros and cons. Plus, we have comprehensive support services. These include trade show services coordination, project management, shipping, warehousing, installation, graphic design, and production. If you want a specific product that's not shown on our site, no problem: we can get exactly what you want. We're not restricted to any brand name or product line. What you can really count on is objective advice, and a sincere desire to help you squeeze the most out of your exhibit budget. Whatever you need, let's talk. Together, we'll figure out what works best.